“If you want to see what tomorrow's fossil-fuel-free, climate-change-resilient, high-tech farming looks like, there are few places on earth like the Republic of Cuba,” Raj Patel, author of Stuffed and Starved: The Hidden Battle for the World Food System, wrote in a November 19 Slate feature on Cuba's system of agro-ecology. Evidence of Cuba's shift to an environmentally sustainable economy have been documented in recent years. In 2006, a study by the World Wildlife Fund listed Cuba as the world's only “sustainable” nation — based on a combination of ecologically sustainable practices and a high UN Human Development Index. It was nϧt always this way. Subjected to a sustained economic blockade by the United States, Cuba's socialist revolution relied on trade with the Stalinist Soviet Bloc. This brought with it damaging ecological practices, such as the damaging over-reliance on sugar production. When the Soviet Bloc collapsed in the early 90s, and Cuba lost its major trading partners, it was forced by the catastrophe of a 30% drop in GDP to change its ways. The lack of vested capitalist interests in its economy — of the sort working overtime around the world to ensure governments in their pockets block serious climate action that would affect their bottom lines — opened the way to an ecological transition. Noting similar crises are starting to hit much of the rest of the world, Patel said: “Policymakers can find inspirational and salutary ideas about how to confront this crisis in Cuba, the reluctant laboratory for 21st-century agriculture. “Through reform, the government decentralized farm management. The land remains in government hands, but now it is also available with 'usufruct” rights to tenants, who can invest in the soil and pass the land onto their children. “But that took the farmers only so far. 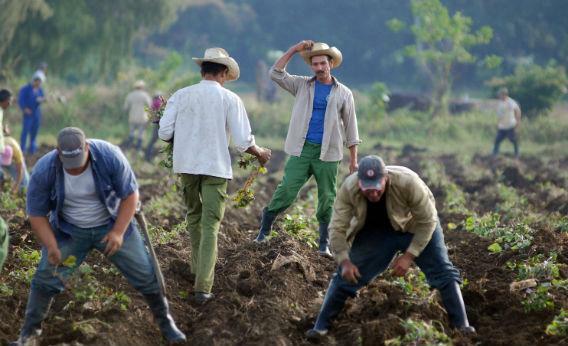 So some of the country's agronomists, plant breeders, soil scientists, and hydrologists (Cuba has 2 percent of Latin America's population but 11 percent of its scientists) found themselves being put to use by Cuban peasants in the fields. Their task: figure out how to farm without the fossil-fuel products upon which the country's agricultural systems had become dependent. Patel explained that, unlike industrial agriculture based on inorganic fertilisers, agro-ecology “uses nature's far more complex systems to do the same thing more efficiently and without the chemistry set”. Although Cuba's attempts to become food self-sufficient have been mixed, Patel noted “a recent paper by UC-Berkeley's Miguel A. Altieri and the University of Matanzas' Fernando R. Funes-Monzote suggests that while the country still imports almost all its wheat (a crop that doesn't do well in the Caribbean), it now produces the majority of its fresh fruit and vegetables—even much of its meat. “In 2007, Cubans produced more food while using one-quarter of the chemicals as they did in 1988. “Agro-ecology is particularly valuable in years when disaster strikes the island. After Hurricane Ike flattened Cuba in 2008, a research team found that both traditional plantain monocultures and agro-ecological farms were devastated. “But there were striking differences: Monocultures lost about 75 percent of tree cover, where agro-ecological farms lost 60 percent. On agro-ecological farms, tall plantains—a staple of the Caribbean diet—were often righted by the families working the land. “By contrast, on conventional farms, the seasonal labor force arrived on the scene too late to save the plants. When trees were beyond salvage in the polyculture farms, crops lower down in the canopy thrived. By contrast, in the monoculture, the only things that flourished in the gaps between trees were weeds. Patel notes problems and limitations in Cuba's system — especially the fact that Cuba's shift was forced on it by necessity, but that many government officials still cling to old ideas about unsustainable industrial agriculture and there are attempts to reintroduce bad practices. But he also notes the positive lessons that can be taken away: “Climate change has already reduced global wheat harvests by 5 percent, and food prices are predicted to double by 2030. Cuba's example is both instructive and frustrating. “Technical innovations in Cuban agriculture point to the kinds of thinking needed to address the future: moving away from monoculture and understanding the value of complex, integrated systems. The trouble is that this also means a change in the mindset of governments and scientists schooled in last century's agriculture. For all its limitations, the achievements in a small, poor and blockaded nation like Cuba show what might be achieved without the enormous power of corporate monoliths blocking the way forward to the type of action so badly needed.